SpeederLan-Bis delivers Ethernet services over up to four or height copper pairs at very high speed according to the ITU-T G.SHDSL.Bis / G.991.2 or IEEE 802.3ah Ethernet First Mile standards. Its 11.4 Mbps per pair speed, copper pair bonding technology and Ethernet protocols for VLAN, Provider Brdge (Q-in-Q) and QoS, help Service Providers and the industry to operate up to 90 Mbps Symmetrical Ethernet services over very long distance on existing copper lines. It enables high speed 90 Mbps Ethernet bandwidth on existing copper pairs for the mobile backhaul operators, Hot-Spots or other industry networks. SpeederLan-Bis runs up to 11.4 Mbps per pair on 0.4 mm / AWG26 copper lines, or it reaches up to 8 km at 1.5 Mbps. The thicker copper line diameter, the longer distance to reach up to 12 km on 0.9 mm wire gauge. An Automatic Adaptative connection mode probes the the line quality to connect at best speed. 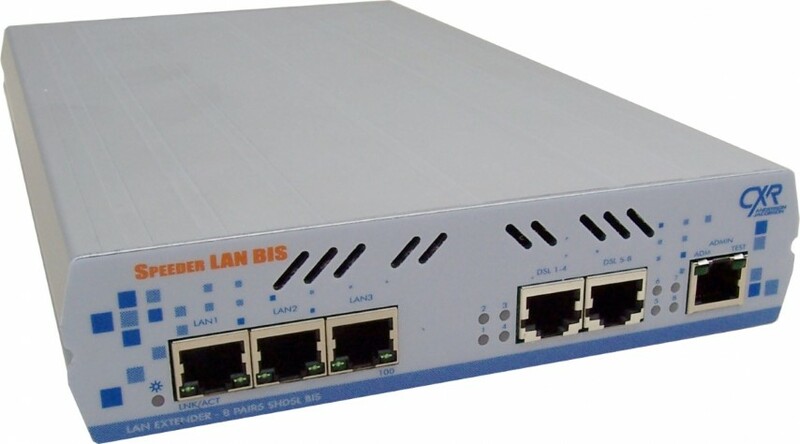 SpeederLAN-Bis brings three Ethernet 10/100BaseT ports for connecting to Ethernet devices or networks as well as for managing the product. SpeederLAN-Bis enables point to point or multipoint interconnections, or a ring topology with resilient STP protocol. SpeederLAN-Bis comes either as a compact metallic desktop product with a choice of 110/230 Vac mains or 48 Vdc power input, or as a rack-mount card for the CXR AMS4 or AMS16 19'' chassis. The SWM-GSBIS-xxCPE is a 19” 5U concentration system made of a AMS16-2DC-200W chassis and SpeederLAN-Bis-2x2 or SpeederLAN-Bis-8 cards and a Gigabit Ethernet switch. This solution can concentrate up to 32x CopperLAN-Bis or CopperWay-Bis links in 2/4 wires mode, or 32 SpeederLAN-Bis-4 or 16x SpeederLAN-Bis-8 distant devices. The SWM-24GSBIS is a 19" 1U concentrator Layer 2 Ethernet switch with 24x G.SHDSL.Bis ports and 2x Gigabit Ethernet copper / SFP combo ports. This solution can concentrate up to 24x CopperLAN-Bis in 2 wires mode or 12 in 4 wires mode, or 6 SpeederLan-Bis-4 in 4 wires mode.